Perhaps the most difficult part of loving and forecasting the weather is watching an event like last month's floods in Colorado. It can be tough to reconcile the passion, energy, and excitement of weather forecasting with the devastation of a force so powerful, so harmful, and so hurtful to so many people. Part of what we try to do here at Weather5280, along with other meteorologists, is to provide people with the information they need to prepare for such events, and translate that passion into accurate, timely forecasts and reports. Last weekend I spent some time exploring a small area of the flood ravaged parts of our beautiful state. What I saw was a story of incredible resilience, and a story of destruction you do not often associate with Colorado. While there has been great progress in the rebuilding effort, many communities are still months, if not years, away from a return to normalcy. Behind it all was an immense amount of rain which fell during an eight day stretch during mid September. Over the last couple of weeks I have been putting together multimedia feature on the floods, hoping to help tell a story which has been difficult to comprehend. 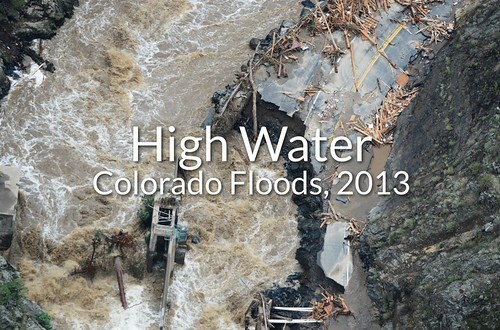 In High Water, I explore a few of the hardest hit communities across northeast Colorado, look at the record breaking precipitation statistics, and explain the primary elements that fell into place to cause this historic flooding.